Hey everyone, I just bought my first ever Jazzmaster and I'm looking for advice on how to make it the best ever gigging guitar. I play pretty aggressively so the tune-o-matic bridge on the Squier contemporary was what sold me on it (not to mention that Surf Pearl finish). This is my first mod and I have no experience with aftermarket parts. -check the frets with a fret rocker and see if you can benefit from a fret level. -Bourns pots. These are what Fender put in that $13,000 custom shop EVH guitar a few years back that EVH gigged with all summer. So you know they are durable. -Maybe a tuner swap -- if you are good about only 'tuning up' to pitch even the old trapezoid tuners can work. -Graphite 'lock lube' in the nut slots and saddles. If your model has the rhythm circuit, and you don't use it, then I'd simplify down to master volume, master tone, 3-way switch. Look up the 'Jazzblaster' models used by Sonic Youth. His is the JM with active electronics. It's probably pretty quiet, and the pots might not be a straightforward swap (I haven't opened one up to see what they use, some active systems have circuitry built into PCBs on the pots). A good setup and fret leveling is always beneficial. Making sure the nut is slotted well is half the battle of keeping good tuning stability (maybe more like 90% in a hardtail guitar such as yours) but nice high-ratio tuners are always an upgrade I like to make. Other than that...well, is there anything lacking in the way the guitar sounds? It's got active pickups which are often love-or-hate. They'll be quiet and drive long cable runs easily, which is very practical for gigging. There's nothing to change to make it an "ultimate gigging" guitar unless it's failing to meet your requirements. So I have picked up some Fender locking tuners as the first step. I forgot to mention the guitar has active pickups (important detail to leave out, oops!) I don't have much experience using actives but so far I don't hate them. Removing the tone pot (which I always keep at full) and filling the hole with an on/off toggle for the pickups. Replacing the bridge pickup (I rarely if ever use the neck) with an EMG 85. Replacing the bridge. (Currently considering the Evertune system but I have zero experience with it and am open to feedback and other suggestions). As for a fret dress I will absolutely look in to that as the next step if they're not level, the neck needs to be. The fret board edges for sure need a bit of rounding. Consider that rounding the fretboard edges, which is an immensely popular mod that improves nothing at all in terms of music making, will make your usable fret area smaller, which will put the strings closer to the edge of the frets. This is a huge problem, while a lack of soft sanded down fingerboard edges is just a faddish complaint. While you may not yet have struggled with a guitar with rolled board where the strings slip off the edge of the frets when playing, just take into consideration that in addition to the ongoing struggle to find the perfect JM bridge that keeps the strings in far enough from the edge of the board, there are also quite a few players who discovered that some top dollar CS Fenders are almost unplayable due to the rolled fingerboard edges putting the strings too close to the edge. Players have replaced all the frets only to find that the wood was sanded off, and new frets cannot be installed at the full width. So they replace the neck with one that has not gotten the hip "lets sand off the edges!" mod. Cheap necks or necks kept in overly dry conditions because players feel they shouldn't need a home humidifier for Rock & Roll will get fret sprout, but the solution is not rolled edges. Be careful whose solutions you choose for your own guitars problems! For my own guitars I actually prefer fret ends that are even more upright and square than typical. Cheaper import guitars tend to get the fret ends filed at a more extreme angle because it's cheaper than properly rounding the sharp edges off all the frets, which involves time consuming hand work. Good fretwork and practice nets better performance than grinding off wood and metal to achieve a target "comfy" soft feel. Notably though, this model with the extra narrow Gibson bridge spacing doesn't have the problem with strings too close to the edge. If you ever decide to swap out the bridge it might become an issue if you've narrowed the playable fretboard width. Just my 2 cents and don't take this the wrong way, but it sounds like you're just looking for things to change for the sake of changing them. I think we've all fallen into that trap. Most of the people who do these "gigging guitar mods" (as opposed to experimenting) do it from experience -- either it's let them down on that guitar so they change it for the better, or it's happened on a different guitar so they know how to avoid it. My advice would be before you spend a bunch of money, spend a good deal of time playing the guitar so you can actually get to know your issues with it. It's hard to fix something you don't know is broken. Or, y'know, go nuts. Modding is fun. Rip the neck pickup and switch right off so it's two less things to worry about. There's definitely an element of wanting to have something that's unique to me and one of a kind. I appreciate the feedback. I'll spend some time with it before I "fix what's not broken." I'm going to make a few cosmetic changes (pickguard, volume knob), drop a new EMG in there, put locking tuning heads on, and pull the tone pot out and fill the space in with a kill switch, but I'll kick the can down the road on all the other changes (bridge, fret dressing, fretboard rounding) until it's something that I truly feel actually needs doing. Love where you're taking this idea, post pics when you're done! Agreed with the ''don't fix what's not broken'' crowd, ESPECIALLY on the Evertune question. Awesome as they are they are uber expensive at this point and only a few people in the world know how to install and set them up. If you really want an Evertune you'd honestly be better off buying a guitar with one already equipped as the cost at this stage would be more than the Jazzmaster is worth in the first place. This is a great first step. I put locking tuners on everything. They really help keep things in tune. Getting the frets right will make it feel as good as it can. I feel this is as important as any other mod and perhaps the most important. After that, good pots help. I put new CTS pots in an old lawsuit Tele and it came alive. CTW or Bourns are top quality and between the two, I agree with jvin248 that Bourns are the best. Perhaps this is overkill, but depending on how much you play/how hard your grip is, consider stainless steel frets. It’s not too cheap, but you’ll never have to get a fret level or dress again and bends feel smooth as glass. I have two guitars with SS frets and I gig twice a week, definitely best decision for me. Making sure the nut is slotted well is half the battle of keeping good tuning stability (maybe more like 90% in a hardtail guitar such as yours) but nice high-ratio tuners are always an upgrade I like to make. How does one go about determining if the nut is in need of any work or if it's fine as is? want to make the ultimate gigging guitar? simple. dont go by what everyone says will make the guitar better. take the guitar on gigs to figure out what will make the difference. in my old band. we were all really hard on gear so everything went through a trial by fire situation. aka bring the guitar to practice and see how it holds together. if it can survive that then take it on a gig. if it can survive a gig without issue, it's a good guitar. keep in mind it was common for us to throw our guitars across the room or on the floor or even really thrash around with them. so here is what i recommend. if the guitar is noisy at practice? sheild the body cavities, but as mentioned above, a sheilded guitar cable can often fix 50% of the noise/interference. guitar not staying in tune and you know it's the tuning keys at fault? change em. i'm guessing your still quite a young guitar player so you might not fully know what you want/need yet in a guitar. dont worry, that comes with time. ask most the players on here and we'll tell you that to get to know what we want/need in a guitar, we've went through a good 25+ guitars (im probably closer to 100) also, anything can be gig worthy with little modifications. for example. 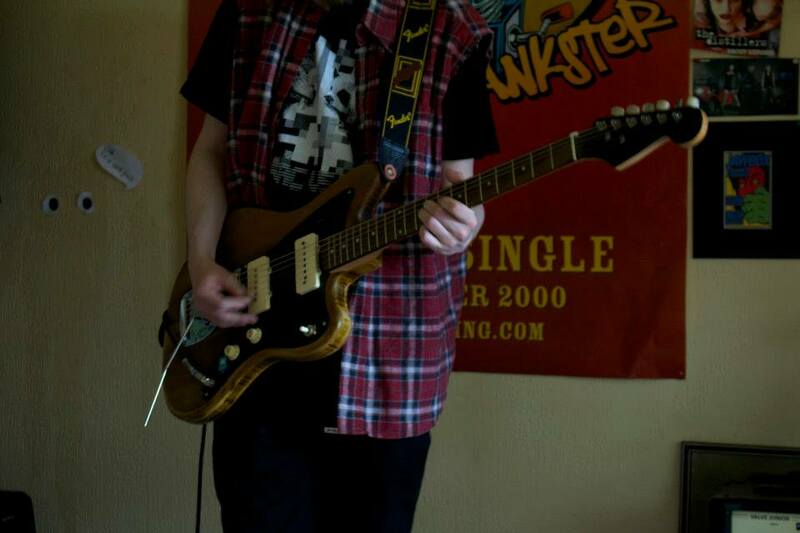 this is my guitar called the jankmaster. because it's janky AF. the pickups are microphonic as hell (this video shows how bad they were.... i fixed it a bit since then. https://www.youtube.com/watch?v=QErwQaNXJ2Q) yet i use this guitar for practices and live because it works well in certain contexts. Tinkering with your guitar is definitely fun and I love doing it, but when I did a 2 month tour, all round America, I went to guitar centre, bought a $149 sparkle blue Squire and used it straight out of the box. People did come up to me throughout the tour asking what pickups I had in it too. I've got a lot of experience working with Evertune bridges, both set up and installation and I can tell you two things for sure. They work amazingly well and are perfect for heavy handed players. It's not worth getting one for this project. The cost of the unit itself, plus the serious rout job you will need to employ someone to do in order to fit it, will almost certainly put you into the price range of a guitar that already has one installed. Other than that, seems like it'll be a fun project! I love the look of these guitars and they look like a perfect mod platform! Here's my test. Tune a string up perfectly to pitch (note - only works when tuning up, not tuning down). Then, bend the hell out of that string. Or, just pull upward on it (away from the fretboard), but bending a note is more musical and fun. Now check if the note fell flat. If it did, it was probably binding at the nut, so the portion between the tuner and nut was under higher tension, which you equalized by pulling it through the bound nut. Once you do this, press firmly on the part of the string between the nut and tuner. Now plate the note again. Did it go sharp? Once again, you're pulling the string through the nut slightly and checking if it's stuck. If you can reliably get a string to stay flat/sharp with this method, it's diagnostic for binding at the nut (meaning the slots need to be widened and/or lubricated).